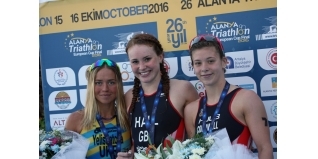 Great Britain's Lucy Hall added another Gold medal to finish what has been a successful season for the London 2012 Olympian, by winning the Alanya ETU Triathlon European Cup in Turkey on Saturday. The small field included three of the best swimmers in the sport - the British trio of Hall, Jessica Learmonth and Sophie Coldwell. Predictably, they set a blistering pace in the water to gain a minute's lead in the water over the chasers which included ETU Series points leader, Yuliya Yelistratova (UKR). We've seen the tactics many times this year with Hall and Learmonth, but this time it was a trio and they further extended their advantage by working hard on the bike, even overcoming a crash for Hall, where Coldwell and Learmonth waited for their team mate to recover and get back into the race. Starting the run the Brits had extended their advantage over the Ukrainian to more than two minutes and headed off in search of a podium sweep. A calf injury for Learmonth would soon put her out of the race, but Hall was not going to be challenged. A 37:52 run meant that she lost just 48 seconds over the 10km to Yelistratova, who managed to pass Coldwell for second place. Such a nice way to end my season. Couldn't have done it without Jess & Soph waiting for me after crashing. The result meant that Yelistratova took the season rankings ahead of Hall and Valentina Zapatrina(RUS), with Learmonth in fourth.